Where is the Selenga River? Selenga River of Mongolia and Russia. 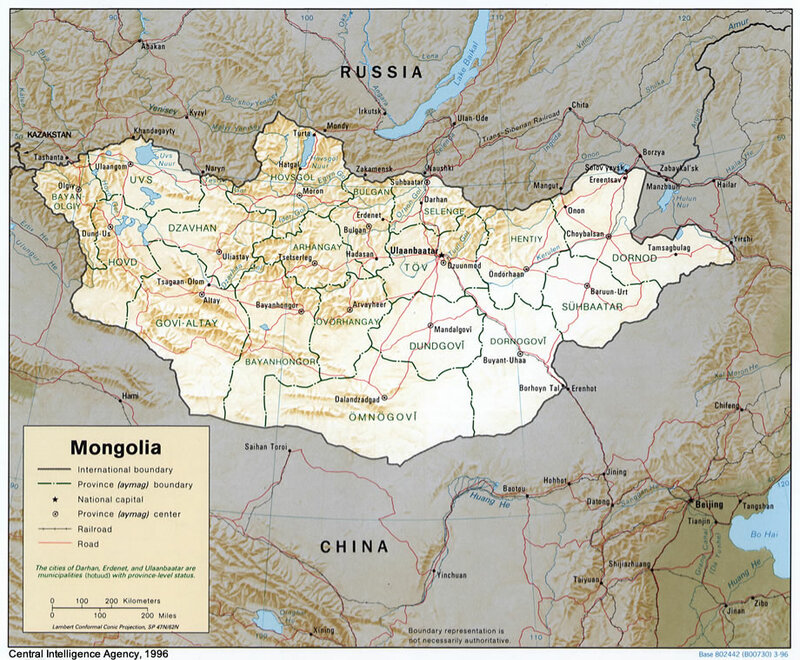 In Mongolia large amounts of water are used to irrigate fields of wheat and other grains. Near the delta in Russia, networks of canals have been built to irrigate agricultural land. These can be viewed by enlarging the satellite image on this page. 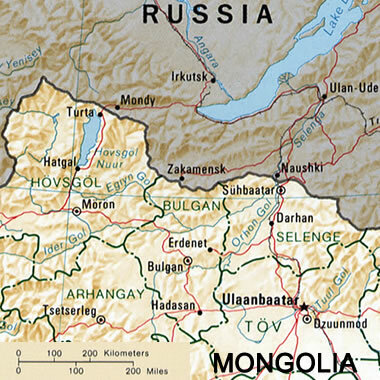 Map showing the Selenga River's course through parts of Mongolia and Russia: The Selenga River delta is clearly visible on the southeast shoreline of Lake Baikal. Map by the Central Intelligence Agency. Enlarge map. 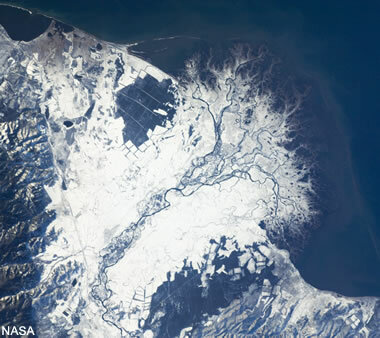 As the Selenga River approaches Lake Baikal, it crosses a broad alluvial plain where the river slows down, begins to deposit sediments, and develops a meandering course. The Landsat image above shows the braided river channel, channel cutoffs, and oxbow lakes. The river has deposited enormous amounts of sediment into Lake Baikal. The result of this deposition is a large lobate delta over 25 miles (40 kilometers) wide. Depositional bars have formed in front of the delta from reworked sediments (these can be clearly seen by enlarging the snowcover satellite image below). The lobate shape of the delta and its numerous distributary "bird feet" show that the delta has not been significantly modified by the actions of lake tides and waves. National Aeronautics and Space Administration, 2011, Snowfall on the Selenga River Delta, Russian Federation, Astronaut photograph from the International Space Station displayed on the Earth Observatory website. 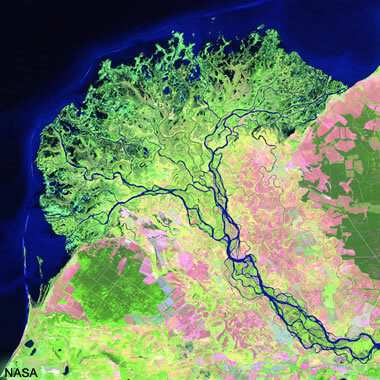 United States Geological Survey, 2011, The Selenga River, USGS Delta Research And Global Observation Network (DRAGON). 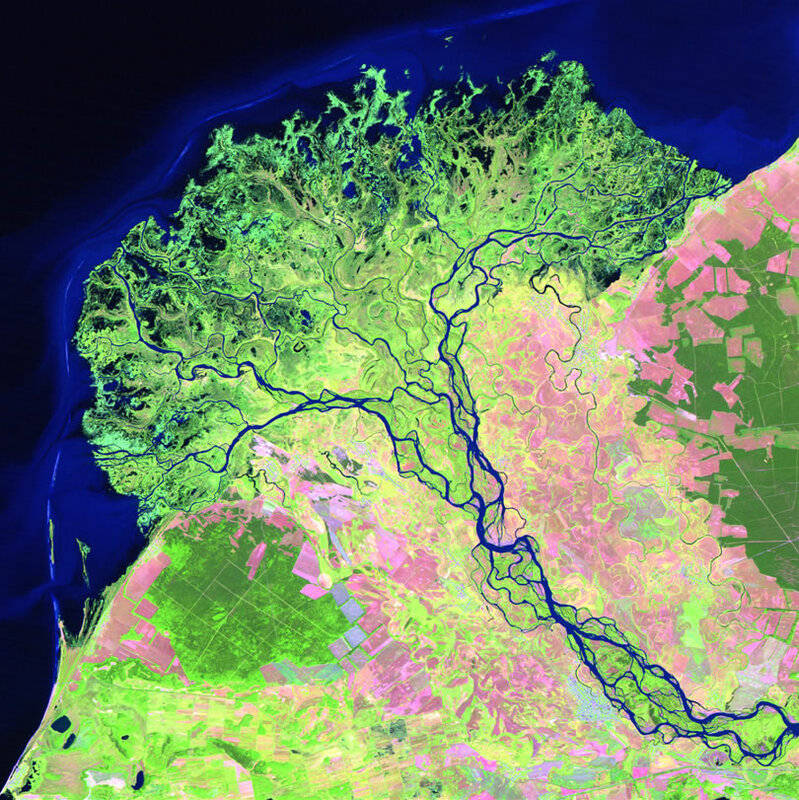 United States Geological Survey, 2010, The Selenga River Delta, USGS Landsat image archive. The Ramsar Convention on Wetlands, 1997, Selenga River Delta, Information Sheet on Ramsar Wetlands. United Nations Environment Programme, 2008, Integrated Water Management Model on the Selenge River Basin, Research report and status survey. A hydro-electric power plant, the Irkutsk Hydroelectric Power Station, was built on the Angara River, the only river draining Lake Baikal. The dam regulates the flow of the river and causes water-level fluctuations in Lake Baikal. These water-level changes result in a large part of the Selenga Delta being waterlogged and then drained in response to activities at the power station.